Cooking with Andrew: Ridiculous: Family "Too Fat" To Work Wants More Benefits! 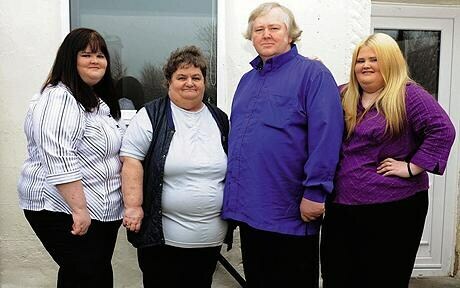 Ridiculous: Family "Too Fat" To Work Wants More Benefits! I cannot describe my level of disgust right now. Before I start, let me say I'm not hating on fat people right now. After you read this you'll probably share my disgust. Anyways, this family lives in BlackBurn, UK. They weigh a combined 1162 pounds. Of course, obesity issues are a prevailing problem in many developed countries, so why am I picking on these people? The Chawners haven't worked in 11 years. They claim a yearly £22,508, which is a little more than $40,000. Guess what? They want more! Mr Chawner says, "What we get barely covers the bills and puts food on the table. It's not our fault we can't work. We deserve more". This is what they have on an average day: cereal for breakfast, bacon butties for lunch and microwave pies with mashed potato or chips for dinner. Really now? Their reasoning for being unemployed is that "All that healthy food, like fruit and veg, is too expensive. We're fat because it's in our genes. Our whole family is overweight". Emma, one of the daughters, says, "I'm a student and don't have time to exercise". I beg to differ Emma. I can spew an endless amount of profanities right now, but I will refrain myself. I am simply outrage by their lack of digity. They make excuses to live off taxpayers. They continue to eat unhealthy foods and refuse to exercise even though they are obsese and unemployed. The solution is extremely simple: get off your caboose and take a walk (even to the grocery store). There is one bright side I see in all this. At least the chances of there being a next generation of these idiots are low (heart disease anyone?). Would any sane man want to be with one of their daughters? They lack motivation, digity, and arguably intelligence. Enough from me, what do you guys think? This is truly disgusting. Do they have a reason for not working? Besides being obese? I think story would have a great place on blog awkward as well. Would you mind if I resposted this? They have epilepsy, asthma,and heart problems, all a result of being overweight. All of their problems are self-afflicted, so I don't see why they can't work.